China's People's Liberation Army is on a fast path to modernisation. Following years of double-digit budget increases, the military has acquired submarines and naval destroyers. Aircraft carriers and Chinese-made fighter planes are in development. In 2010, technology to destroy missiles in mid-air was tested. Now, it seem the generals have forged a new marketing strategy. In its latest white paper, the defence ministry takes pains to outline the PLA's work relating to peacekeeping and natural disasters. It confirms information on the military's structure that previously was only available from analysts outside mainland China: The names of the PLA's divisions and brigades and the numbers of active personnel they contain, in addition to the missile line-up. 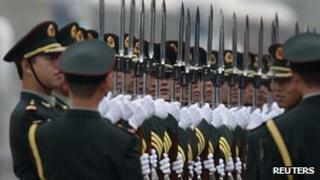 Of course, the PLA is far from an open book; a great deal of information is still classified. However, the bid to come across as a modern, professional military with nothing to hide marks a change from times past. According to the white paper, China's ever-expanding military follows one over-arching principle: "We will not attack unless we are attacked; but we will surely counter-attack if attacked." However, it highlighted "multiple and complicated security threats" facing China, and China's need to protect its "national unification, territorial integrity and development interests". The white paper reveals details of China's military structure. According to state-run news agency Xinhua, this is the first time such information has been disclosed publicly. Correspondents say this appears to be part of an effort, on the part of the Chinese military, to become more transparent. The territorial army has 18 combined corps in seven military area commands: Beijing, Nanjing, Chengdu, Guangzhou, Shenyang, Lanzhou, and Jinan. The air force has 398,000 personnel and an air command in the same seven military areas, while the navy commands three fleets: the Beihai Fleet, the Donghai Fleet and the Nanhai Fleet, the paper said. The paper also describes the role of China's second artillery force, which contains China's nuclear and conventional missile forces. The force is crucial to China's "strategic deterrence", and is "primarily responsible for deterring other countries from using nuclear weapons against China, and carrying out nuclear counterattacks and precision strikes with conventional missiles," the paper said. The paper also criticised the US's increased presence in the region. "The US is adjusting its Asia-Pacific security strategy," it said, adding later that "some country has strengthened its Asia-Pacific military alliances... and frequently makes the situation there tenser." The US has increased its military presence in Asia in recent years, as part of President Barack Obama's "pivot to Asia". The white paper also addresses "issues concerning China's territorial sovereignty and maritime rights", criticising Japan for "making trouble over the issue of the Diaoyu Islands". The islands, known as Senkaku in Japan and Diaoyu in China, are controlled by Japan but claimed by both China and Taiwan. Separately, the paper describes "'Taiwan independence' separatist forces" as the biggest threat to cross-Straits relations. Taiwan is an island which has for all practical purposes been independent since 1950. However, China views the island as a rebel region that must be reunited with the mainland - by force if necessary.